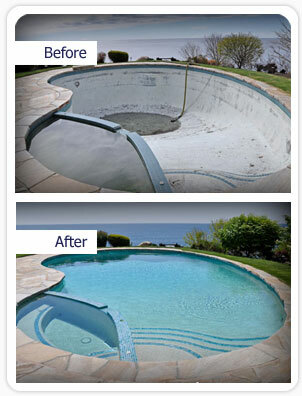 The pool renovation experts at All American Pool-N-Patio, Inc. can make your old concrete pool look like new! With over 260 years of combined experience, our pool technicians are career men and women. You can trust your pool renovation to our experienced staff. When you have your pool resurfaced by All American Pool-N-Patio, Inc., we will provide you with 1 month of free pool cleaning service assuring your new surface is properly cured. Our most popular surface option is the exposed aggregate finish Marquis. Pool refinishing, tile replacement, re-marcite, and re-decking are our specialties. 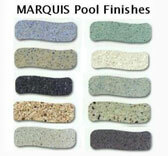 Marquis is a factory-blended mixture of polymer modified cement, quartz aggregates, and various admixes specifically designed as an exposed aggregate coating for the interior of swimming pools. All American Pool-N-Patio, Inc. also re-tiles, re-decks, and re-surfaces pool interiors with marcite or exposed aggregate finishes. We do paver decks. We install ladders and handrails and remove slides and diving boards. All American Pool-N-Patio, Inc. is a licensed and insured and a proud member of the Florida Swimming Pool Association. Visit us for all your pool supplies. All American Pool-N-Patio, Inc. – Service is Our ONLY Business!